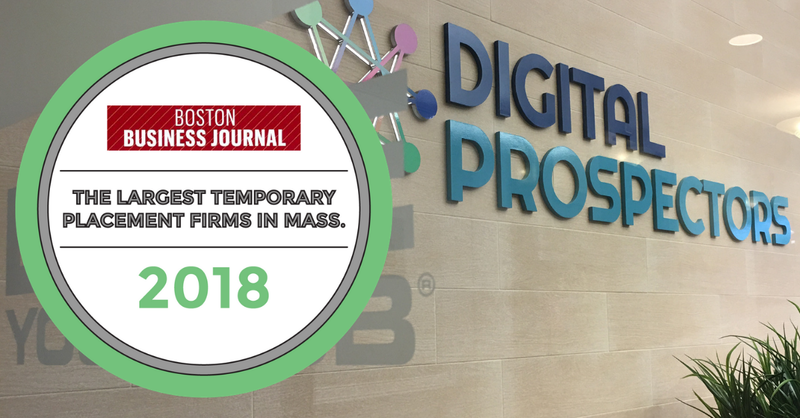 Digital Prospectors has once again been recognized by the Boston Business Journal in its annual “Largest Temporary Placement Firms in Massachusetts” list. This is the fourth year in a row that Digital Prospectors has earned this distinction. Digital Prospectors came in at #16 on the list with 177 average number of temporary employees supplied daily in MA as of June 1, 2018. “As always, we are proud to be recognized as one of the prominent temporary placement firms in Massachusetts. Our goal is to connect candidates with jobs they love, and Massachusetts’ booming tech scene and economy is facilitating both top notch talent and jobs,” said Justin Pleadwell, Marketing Manager. Digital Prospectors has placed thousands of employees and contractors with companies across the United States, but New England is our home and we are so proud to be such a trusted provider of temporary workers in the state of Massachusetts. Also, we want to thank the Boston Business Journal for this recognition. See our other accolades that we have earned recently! We love our jobs and think you should too! Click the buttons below to learn more.